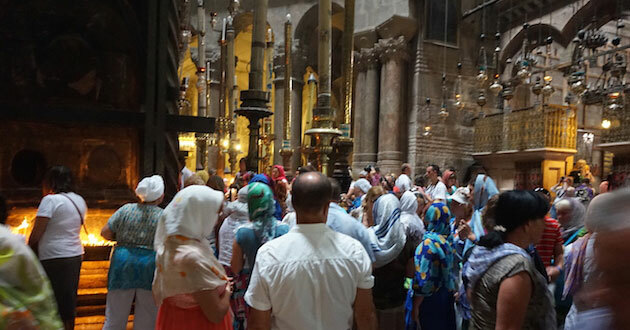 If you’ve been to Israel you’ve most likely toured the Church of the Holy Sepulchre. It’s a must-see stop on most Catholic and Protestant tours. But you don’t have to be Catholic or Orthodox to appreciate and marvel at this 12th Century architectural wonder. The church was built 800 years, is one of the oldest surviving churches, and rivals the great cathedrals of the world. When touring you can even see portions of the fourth century basilica on which it was built. The site is shared between Roman Catholic, Greek and Armenian Orthodox authorities. For the last 200 years, construction and restoration efforts in the church have been delayed due to tension between the Catholic and Orthodox groups controlling it. On a tour several years ago sponsored by Nazareth Village, my wife Anita saw evidence of that tension and the difficulties surrounding its preservation. On Anita’s tour, the guide pointed out a ladder leaning up against a wall near the entrance. The ladder had remained there for years because the Catholic and Orthodox priests could not determine which group had the authority to move it. Later, on our family trip to Israel in 2015, Anita, and me along with our daughters entered the church. “Wait,” said Anita, excitedly, “Let’s see if the ladder is still there!” Sure enough, it was, leaning against a wall as a testament of the difficulty of different groups trying to preserve such a historic treasure. But why so much concern for control over the church? 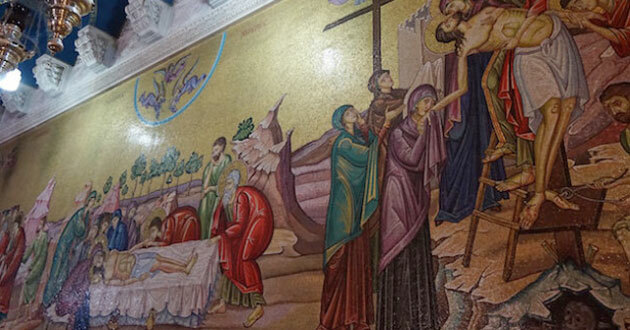 Many consider the church to have been constructed above the burial site of Jesus. So important is the church that the Israeli Government has helped to oversee the restoration. For safety reasons, the Israeli Antiquities Authority closed the part of the site beginning in June 2016. The Edicule is the small structure in the Church of the Holy Sepulchre in the Christian Quarter of the Old City of Jerusalem. It houses the stone slab said to have held Jesus’ body after he died on the Cross and the place where he rose from the dead. In that amount of time, the limestone and marble walls surrounding original stone slab began to crumble. In 1947 British archeologists and engineers reinforced it with a steel cage. Under the restoration plan of the past year, the restoration team, led by Antonia Moropoulou from the National Technical University of Athens, reinforced the walls with titanium bolts and cleaned candle soot and pigeon droppings from the stone slabs. The restorers were able to remove the marble covering on the tomb to reveal the original stone slab on which the Jesus’ body rested — seen for the first time in over 500 years. They were able to cut a hole in the wall so that visitors can now look into the tomb to see the stone. The project, so far, has cost $3.3 million and additional funds need to be raised to continue the project. No word yet if anyone has moved the ladder.